I spent a day in the desert near Palm Springs, Calif., testing the Urus on a track, on the road and even off-road (per Cars.com’s ethics policy, we pay for our transportation and lodging at such automaker-sponsored events). The Urus’ styling is a bit subdued by Lamborghini standards, especially in profile where the Urus’ shape is reminiscent of the Jaguar E-Pace. However, when seen from the front or the rear, the creases do more to give it distinction and the lower front fascia is unusually expressive. If that doesn’t do it, the growl from the 650-horsepower, twin-turbocharged 4.0-liter V-8 should be enough to let bystanders know this isn’t a normal SUV. Peek under the Urus’ bodywork, however, and what’s there is familiar. The Urus rides on a Volkswagen Group platform shared with the Audi Q7, Bentley Bentayga and Porsche Cayenne. It’s got the two-screen center stack overflowing with touch-sensitive controls found in the new Audi A6 and A7, and it even uses a version of the Audi Virtual Cockpit in the gauge cluster (though to be fair, the graphics are different and more stylized to fit the Urus). I’m sure there are a few other common touchpoints, which may bother some, but it didn’t bother me. The interior has enough class to it, including a wonderful pair of front seats, that it seems like it fits in a vehicle of this price, starting at a cool $200,000. The twin-turbocharged 4.0-liter V-8 under the hood is the first thing you notice driving the Urus. It makes 650 hp and 627 pounds-feet of torque, mated to an eight-speed automatic and all-wheel drive. That’s enough power to sling the SUV from zero-to-62 mph in just 3.6 seconds and run it all the way up to 190 mph. After driving the Urus on the track, I believe it — power pours on consistently across the rev range, and while driving it in Corsa (i.e., race, the most aggressive of the drive modes) the engine’s responsiveness feels telepathic. The eight-speed helps with that; it bangs out shifts instantly, and if you don’t feel like employing the paddles, it feels ready for track duty, holding gears appropriately and dipping down without hesitation to sling the Urus from corner to corner. The all-wheel-drive system has a default torque split of 40/60 (front/rear), but that number changes constantly depending on conditions and drive mode. At maximum, up to 70 percent of the torque can go to the front and 87 percent to the rear. 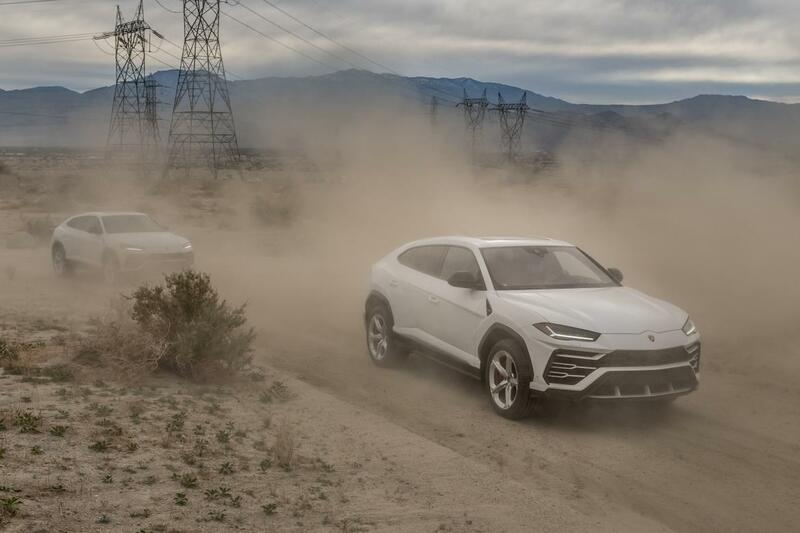 Driving the Urus off-road gave the best example of this, when in Sabbia (sand) mode the throttle could be used to modulate the Urus’ exit on corners with minimal effort. This thing loves to fling dirt. As impressive as it is to drive an SUV that can get up and go like that, what was even more surprising was how quickly it could end the party. 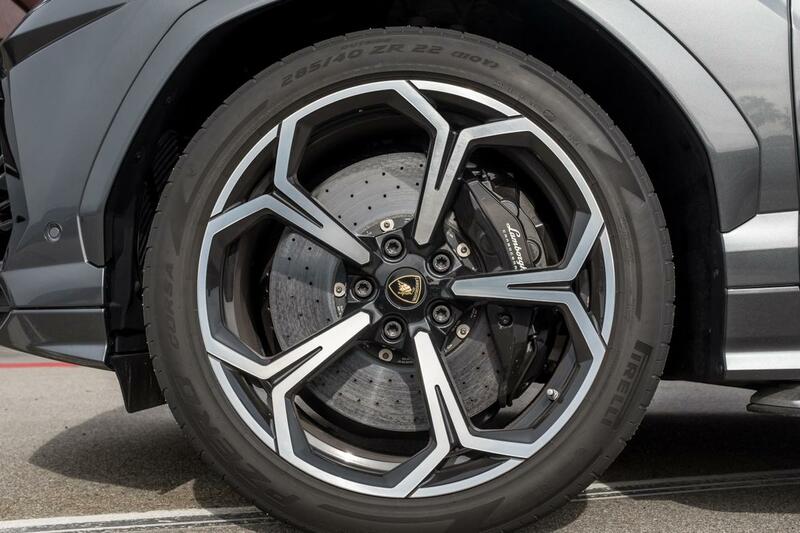 The Urus has standard carbon-ceramic brakes with massive 17.3-inch rotors and 10-piston calipers up front, and 14.6-inch rotors and six-piston calipers in the rear. Lamborghini says they are the largest and most powerful brakes available on a production car, and I was glad they were there to bring the Urus’ roughly 4,800 pounds to a stop. Part of the track time involved an exercise that involved full throttle for about 100 yards, slamming on the brakes in a short cone area and then performing an emergency turn to avoid an obstacle as the antilock brakes engaged. 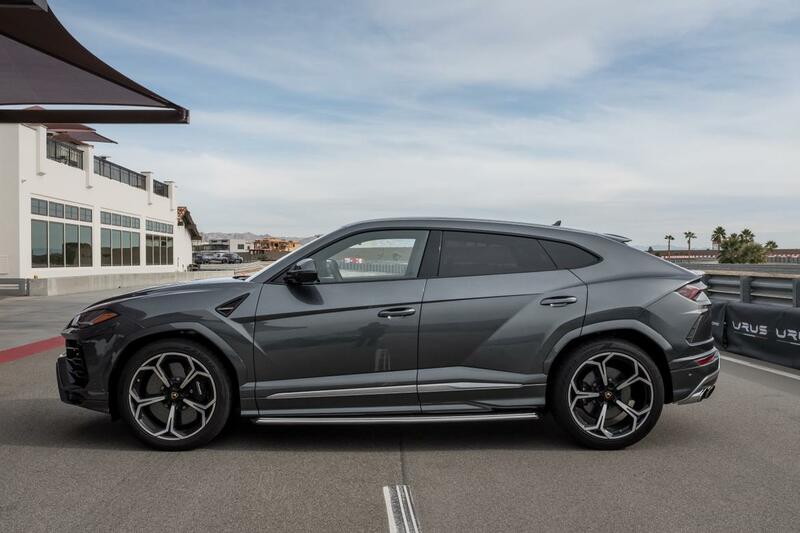 Not only does the Urus stop on what feels like a dime, its suspension wizardry keeps it remarkably composed and from pitching forward so you can execute a hard turn during full braking. It’s absolutely remarkable. What happens to the suspension when the Urus abruptly stops matches the goal of the suspension at all other times — keeping the SUV flat, because flat means it can go around corners faster and feel more stable. That’s very important at the speeds the Urus can reach. This has an interesting side effect: It makes the Urus feel not quite as fast. As the system controls forward pitch on hard braking, it also manages to rock back when you stomp on the gas, which mitigates the feeling of acceleration. But take a quick peek at the speedometer and suddenly you notice the numbers flashing by — the Urus did a distinctly yawn-inducing 115 mph on the track. A big reason the Urus performs in the disparate environments I tested is its air suspension, which can raise and lower the vehicle depending on drive mode. In off-road modes, it raises the Urus to 9.8 inches of ground clearance; in the two most aggressive drive modes, Sport and Corsa, it goes even lower to 6.2 inches. Despite the Urus being a bit more German than I had imagined, I came away impressed and optimistic. When you drive it, the details seem intentional to a great degree. 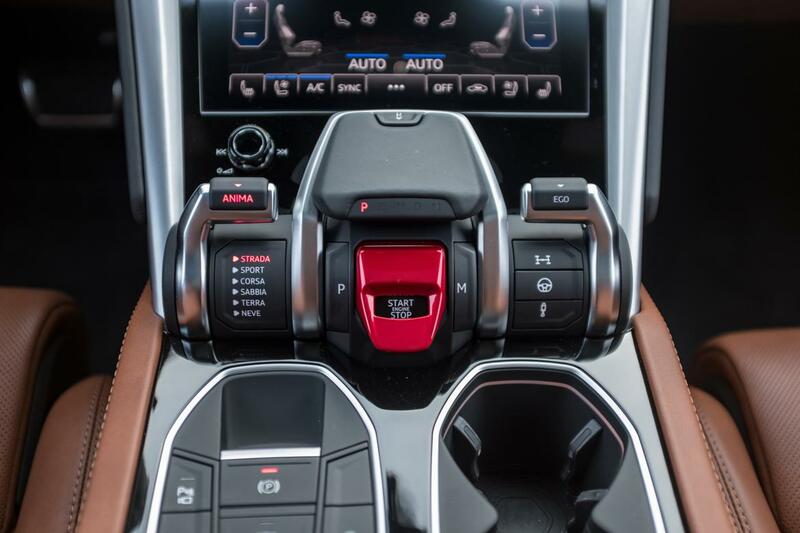 From the way you start the engine by flipping up a red cover to the tumblers used to select drive modes and information shown on the screens, Lamborghini has nailed the little things with the Urus. On top of that, drive modes actually enhance the experience. In Strada, it is comfortable on the road, but bump it up into Sport and the exhaust opens up, tensing the whole vehicle. Throw it into Corsa and the Urus becomes even more alive, and the rumble from the quad pipes turns heads and rattles windows. The off-road modes dial in some slip and raises the Urus so it floats higher over obstacles. 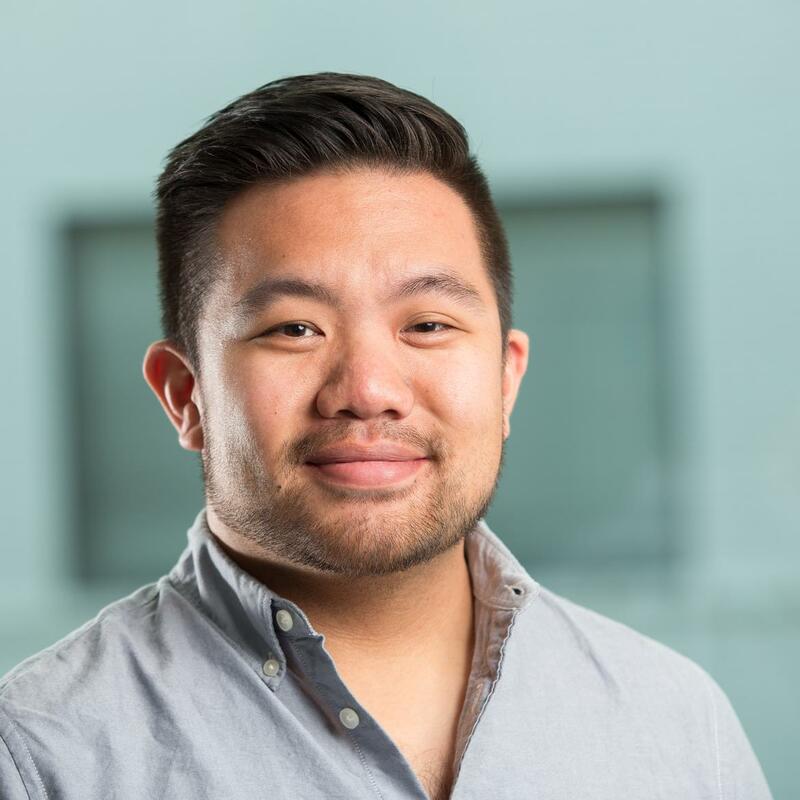 Though this isn’t Lamborghini’s first SUV, current market forces have dictated that all companies — even those in the rarified air such as Lamborghini and, recently, Aston Martin — need to get into the SUV game to continue pursuing their roots and passions. The Urus must exist so that the Aventador and the Huracan can as well; this is the new normal. Next: The demise of the 9-5: What will the future of the office look like?